Thank you for your interest in volunteering with us! 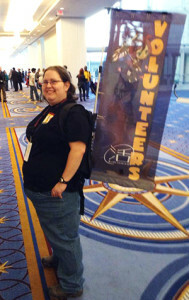 Please read through all our rules and information to learn about volunteering with Katsucon. If you still have questions or want to offer suggestions, you may contact us via [email protected] To receive volunteering updates throughout the year, please subscribe to our volunteers mailing list. Volunteer Sign Ups are now available online until the start of the con. Once the con begins, you may still sign up to volunteer by visiting the Volunteers Registration table. We look forward to meeting you! YOU MUST READ THROUGH THE REQUIRED READING BEFORE FILLING OUT A VOLUNTEER APPLICATION!